Mediterranean Style Turkey Meatballs + Yogurt Sauce — . 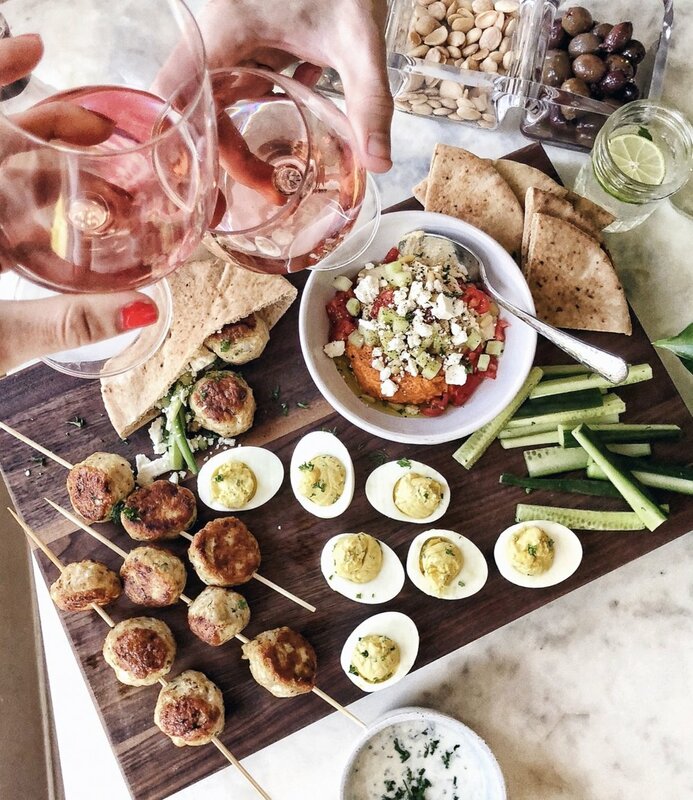 I recently had my friend Tommy over for my favorite Sunday activity: wine and apps! I made some herbalicious Mediterranean style turkey meatballs with yogurt sauce and he brought some delicious better-for-you deviled eggs :) While you'll have to ask Tommy for the devilish recipe, below are all the easy steps to flavor filled #youkongdoit approved protein. Prepare Meatballs: Preheat oven to 350 degrees F. Spray rimmed baking pan with cooking spray. In large bowl or mixer, stir together garlic, egg, onion, breadcrumbs, oregano, mint and salt. Add turkey and mix until just combined. Using hands, gently form into golf ball-sized meatballs. Toss them from hand to hand so the meat compacts into a tighter ball. I put a little olive oil on my hands to keep the turkey meat from sticking. Place meatballs on greased pan. As the meatballs are cooking, prepare Yogurt Sauce. In small bowl, stir together all ingredients. When the meatballs are cooked, to get that golden/crispy outside I put some oil in a sauce pan and browned the balls until they looked picture perfect. Just a minute or two on each side or else they’ll dry up. Cheers! We paired the meatballs and eggs with whole wheat pita, hummus and mixed olives for a full feast.